The nation's fourth largest carrier sent out a Tweet that turned speculation into an official launch date. Wednesday, April 20th, the T-Mobile G-Slate tablet will be in the carrier's stores. Offered at a price of $529.99 after a $100 rebate and a signed 2-year contract, the LG manufactured device is the next Honeycomb flavored Android tablet to hit the market. 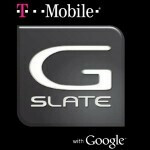 In addition to sending out a tweet, T-Mobile spread the word about the G-Slate in its blog, making favorable price and speed comparisons with the Apple iPad 2 and the Motorola XOOM. T-Mobile compared the price of the 32GB G-Slate to the $729.99 that both AT&T and Verizon charge for the 32GB Apple iPad 2. The XOOM is $599.99 on Verizon and all three tablets use the respective carrier's 3G network. Wait! There's more. The "LG Girl" was given a G-Slate to use as the video below shows you. "OMG! ", she exclaims. The LG Girl couldn't put the tablet down as you will see when you click the play button. Will you be able to put down the T-Mobile G-Slate if you pick one up starting Wednesday? Let us know by leaving us a comment in the box below. Make it $429 after the $100 rebate and you might actually sell some of them. Ok, so $529 for the G-Slute which comes with the LG girl - not a bad deal at all. I will take one, of each. Asus Eee pad transformer, even with a dock is cheaper by $100, has a actual keyboard, 16 hours battery life and does a great imitation of a laptop. Pass.